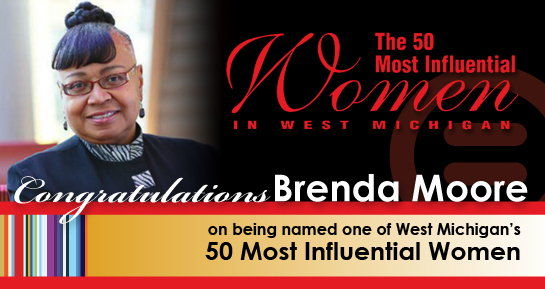 one of the 50 Most Influential Women in West Michigan 2016. In our community there are individuals who come together for a greater good. People who strive to make a difference, taking the extra step needed to create a better life for everyone. On behalf of the Board of Directors and Staff of the Grand Rapids Urban League, we are grateful for your efforts and we support your many accomplishments. May your hard work and community spirit continue to inspire us all. Click here to read the 50 Most Influential Women issue of Grand Rapids Business Journal. Every day Brenda Moore finds reasons to celebrate the work of the Grand Rapids Urban League. Moore's service to the community through supporting the development and success of Grand Rapids' minority youth has made her the winner of the Dorothy Woods Staff Excellence Award, Grand Rapids Urban League Leadership Award and the Michigan Cities in Schools Volunteer Award. Moore is a 30-plus-year employee of Grand Rapids Urban League, the agency's longest tenured employee, having served four of the seven presidents and serving three times as interim CEO. She is credited with history-making programming. "Being the creator of the League's all-male program, Urban Fellows, and the girls program, Our Girls Rock, makes me extremely proud to know that I indeed have some influence on the next generation and those to come," Moore said. "Touching a young life now pays off later in major way. If I have the opportunity to influence at least one life my life is enriched for it." Lynne Jarman-Johnson, chief marketing officer at Consumers Credit Union, has sat on the board of directors of the GRUL with Moore. She called Moore an "inspirational leader" and "a true angel in our community." "She single-handedly took on the redesign and renovation of the Grand Rapids Urban League. Her role in taking her locally created program designed to keep children away from secondhand smoke has been recognized nationally. She is an amazing support to CEO and staff at the Urban League," Jarman-Johnson said.